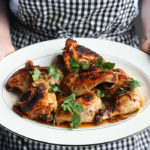 Sink your teeth into oven baked barbecue chicken like Grandma used to make. Chicken pieces are baked in a homemade sauce and seasoned with fresh onion slices for added flavor. Heat oil in a large skillet over medium high heat. Add chicken in batches and brown on all sides. Arrange chicken in a single layer in a 9 x 12 x 2-inch baking dish. Combine the tomato juice, white vinegar, sugar, Worcestershire sauce, ketchup, mustard, black pepper and salt. Pour the sauce over the chicken. Arrange the onion slices over the chicken. Bake for 1 hour, basting every 10 minutes, until the internal temperature of the chicken reaches 155 degrees. If you want crisper skin, switch the oven to broil and roast it under the heat for a few more minutes. Allow chicken to rest for 15 minutes before serving.